New Scotland captain Andy Robertson is relishing the chance to come up against Belgium's Eden Hazard, but knows all about the dangers the Chelsea winger poses. Robertson, who was named as skipper by manager Alex McLeish earlier this week, will lead his side out for the first time against the World Cup semi-finalists on Friday, live on Sky Sports. The Liverpool full-back says that Belgium, who are ranked No 2 in the world rankings, will be a stern test ahead of their UEFA Nations League opener against Albania on Monday. Speaking about facing Hazard, the 24-year-old said: "He is probably in the top five [players in the world] at the minute. I have come up against him many times so I know what threat he can have. "He is special. The way he turns and gets at players and commits two or three defenders, there's not many that have that. "The problem with Belgium is, you can't focus on just Hazard because somebody else pops up. We have to be aware of all of their threats. 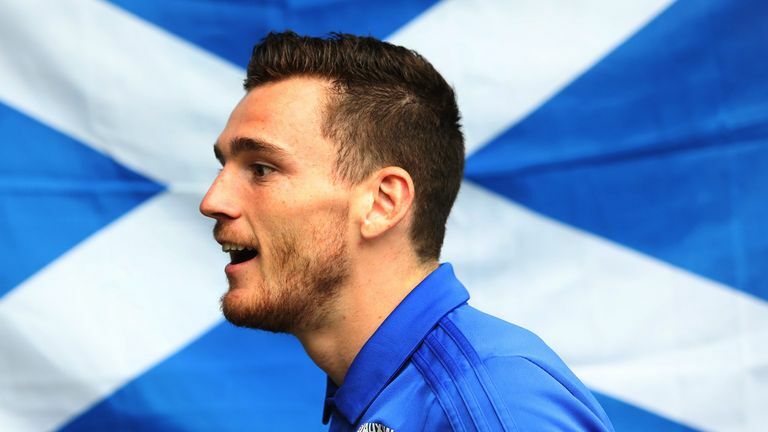 Robertson's main aim as Scotland captain is to lead his country to a major finals for the first time since 1998. Scotland's Women's team reached their first World Cup finals by beating Albania on Tuesday and Robertson says their success has only spurred his team on further. "The game was on the television in the kit room and I had seen the end of it where they were all jumping about and celebrating," Robertson said. "What a fantastic achievement for them. But, of course, it leaves a bit of fire in the belly for any squad and they will be looking at that and say 'that could be us'. That is where we all want to be. "Previous captains will all look back and the one regret they will have is not qualifying for a tournament. "For me, this is a fresh start and I think we have got a really good chance. We have the right balance in the squad. "I do believe that I will be able to lead this team to a championship, but it is about the boys trying to prove that."